In harmony with the recommendations of the Pacific Union Conference Education Code, each student is expected to spend four full years in high school. Courses required for graduation/diploma must be taken on this campus unless a student has failed one of these courses. Full-time student status for the entire second semester. Passing grades in all diploma requirements by specified date. All transcripts from previous schools attended received by the Registrar's Office by specified date. Completion of all correspondence courses with final grades received by the registrar specified date. Payment in full of all school accounts before the beginning of second semester finals week. Approval by the academy faculty. Freshmen: Students who have completed eighth (8th) grade. Sophomore: Students who have earned a minimum of 60 semester units and completed 25 hours of community service. Junior: Students who have earned a minimum of 120 semester units and completed 50 hours of community service. Senior: Students who have earned a minimum of 180 semester units, completed 75 hours of community service and who can complete the remaining courses needed for graduation. Each student is expected to enroll in a minimum of 7 classes (70 units per year/35 units per semester). In addition to these suggested curricula, students must complete 25 hours of community service each school year. 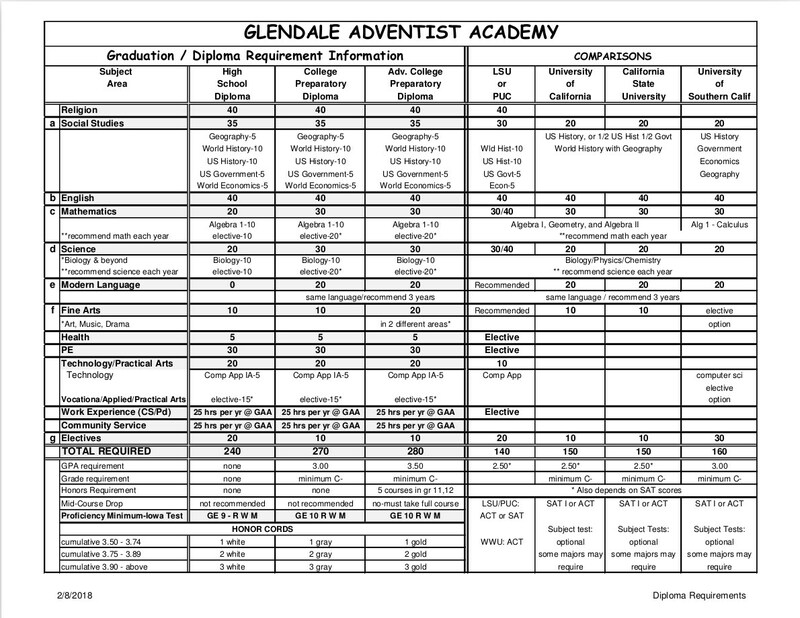 Download the Diploma Requirements below.